A variety of grains are cultivated in India. The best way to taste and experience grain varieties is to travel through villages. Rice and wheat (which is what most people in the city consume) is a luxury for most villagers. Villagers survive on cheaper millets such as bajra (pearl millet), jowar (sorghum), nachni (finger millet/ragi), etc. Generally labeled as food for the poor, these humble yet powerhouse grains rich in minerals are the secret to the villagers’ health and longevity. These grains are diabetic-friendly and gluten-free too! Ragi is staple food of many villages in south India and Maharashtra. Ragi is the first solid food that is given to most South Indian kids. Ragi is rich in calcium and an excellent source of fiber. Most families living in villages include ragi in some form or the other in their everyday meal. Authentic Karnataka ragi recipes include Ragi Mudde and Ragi Roti. Bakhri of Maharashtra is an equivalent of ragi roti of Karnataka. City markets have sophisticated items like ragi cookies, biscuits, khakra, and even ragi puttu powder! Popped ragi powder called ragi huri hittu is also something found in city markets and can be used to make sweets. Ragi malt drink is a popular in many Udupi restaurants. Ragi dosa is also popular although not very commonly seen in restaurants. One way of making ragi dosa is to get readymade ragi flour from the market and make instant ragi dosas that do not require fermentation. But I wanted to make it using whole grains and try sprouting the grain. The process is time consuming but the taste and feeling of satisfaction makes it a truly worthy experience. Sprouting ragi takes roughly 32 hours (depending on the climate in your region). This dosa batter needs fermentation. So plan for your sprouted ragi dosa at least 2 days in advance. Wash and clean the ragi grains in water. Soak the grain overnight/8 hrs in a wide mouthed vessel. Colder climates may need more soaking time. After 8 hrs of soaking, remove excess water. Close the vessel using a thin wet cotton cloth. Leave it to rest for 10-12 hrs or up to 24 hrs. Within 10-12 hrs, you will notice sprouts appearing. The length of the sprouts will depend on the climate in your region. Since it’s cold at this time here, I could get only tiny sprouts. Roughly 6 hrs before you want to make the batter, soak 2 cups of raw rice and 3/4 cup of urad dal separately. After 6 hrs, drain excess water. When your ragi sprouts are also ready, it’s time to make the batter. Grind the urad dal to a smooth paste. Then grind raw rice and sprouted ragi and mix with ground urad dal. Add salt. Mix well using your hand (this aids in fermentation). Leave undisturbed overnight (8-10 hrs). Fermentation causes batter to rise. Ensure that you choose a vessel that has some space to allow the batter to rise. After 8-10 hrs the batter would have risen and is ready to be used. Chop onions, curry leaves, coriander leaves, and green chilies finely. Add to the sprouted ragi dosa batter. Crush cumin seeds and add it to the batter. If you like the plain variety, you could avoid this step. Mix well. Heat an iron griddle. When the griddle is adequately hot, turn fire to low, pour a drop of oil on the griddle, and spread it around using a cotton cloth. Take a ladle full of batter and using the flat bottom part of the ladle to spread the batter. Close the dosa on the griddle using a lid. Since raw rice is used in this batter, closing it with a lid aids in dosa getting cooked faster and makes it soft yet crispy. Turn the heat up to medium and cook the dosa for about half a minute. Remove the lid. When you see that the dosa edges have turned crisp and leaves the sides, drizzle half a teaspoon oil and flip over. Cook the other side for about half a minute. Remove from fire. Serve with sambhar, chutney, or podi. When served with sambhar, sprouted ragi dosa becomes a healthy and wholesome meal. Try experimenting and including this poor man’s grain in your diet. Benefits are many! One of the best ways to include fiber in our diet is to eat whole grains and legumes. Sprouted legume immensely increases the nutritive value of the food. Horse gram is a legume that is high in iron and a good source of protein. It is a fairly good source of calcium as well. Horse gram aids weight loss. For many years I stuck to the familiar diet that is made at home; sambar, rasam, avial, moloshyam (dal curry), and so on. Recently I have been trying to experiment and include new ingredients in my diet. This is good for a variety of reasons. Most hereditary diseases are passed on due to dietary and lifestyle habits in a family. I personally believe that when you include new items in your diet, it reduces your chances of developing certain hereditary conditions/diseases. Here is an experiment with horse gram that I am very satisfied with. A simple sprouted horse gram curry. Soak the horse gram in water for 6-8 hours. Drain the water and clean the horse gram. Remove all the non-viable ones. Keep the drained, wet horse gram covered in the same vessel for the next 8-12 hours. The sprouting time varies depending on the weather in your region. Wash the sprouted horse gram with clean water. Pressure-cook the horse gram with water just enough to soak the sprouted horse gram. Horse gram is a tough legume and takes time to cook and needs cooking time of 2-3 whistles. After opening the pressure cooker lid, you can use a masher to mash some of the horse gram. This helps give a good gravy consistency to the curry. Add turmeric powder and salt and cook for 2-3 minutes. Soak tamarind in warm water, extract tamarind juice, and add to the cooked horse gram. Meanwhile, pour a drop of oil in a pan and add urad dal. Roast until golden. Break the dry red chillies into 2-3 pieces and add it to the roasted urad dal. Roast for less than a minute and turn off. Grind this along with the shallot, jeera, and coconut. Add this to the cooked horse gram. Mix well and cook for 2-3 minutes. When the curry starts boiling and bubbling, turn off the fire. In a pan, splutter mustard seeds in coconut oil. Add curry leaves to the spluttered mustard seeds, turn off the fire, and add to cooked horse gram curry. Serve with hot rice or roti. A simple steamed breakfast/tiffin item that I learned from this blog. Wash the poha and soak it in clean water for about half an hour. Drain out all the water and keep aside. Heat oil in an iron wok and add mustard. When the mustard starts to crackle, add chana dal, urad dal and asafetida powder. If you are adding curd chilies, add at this stage. When the dals turn light brown, add chopped green chilies/red chilies and curry leaves. Add the wet poha, add salt and mix well. Add grated coconut and mix. Ensure that you keep the flame low. When the mixture cools down a bit, take a lemon-sized dough and make smooth round/oval balls (kozhukattai). Keep the balls in an idli plate and steam cook for about 5-7 minutes. Serve with sambar or any chutney. P.S. : You may use normal poha (white poha) also for this recipe. You would need to cut down the soaking time because white poha flakes are usually very light and soak easily. Recently I have been finding one-pot meals very interesting. I never used to like them earlier, only for the reason that I was not familiar with them. At home the only one-pot meal we knew was curd rice, tomato rice, lemon rice, and tamarind rice. Apart from these, I was not used to pilaf or biriyani simply because at home we do not use garam masala. Meal to us meant rice accompanied with a gravy and a subzi. It took me several years to get out of that comfort zone. Karnataka cuisine has many varieties of one-pot meals. The first meal I had at MTR had some of these including Bisibele bath. Personally not a big fan of that one. But vangi bath or eggplant/brinjal rice has been a favorite ever since the first time. Eggplant rice is a very good option to make when you are expecting guests and need to make rice and roti-subzi. This one-pot meal does not need much preparation, can be made quickly, and gives you ample time to attend to other things. It is a convenient lunch to carry to schools and work places. Let me add the disclaimer first! This recipe requires a special powder called Vangi Bath masala powder. Like many other ready-to-mix powders that are available in the market (most famous brand being MTR), this powder is also available. I am not sure if it is widely available like a puliyodarai mix! In this recipe, I have not explained how to make the vangi bath mix because I do not know how to. I bought the masala mix from my friendly neighborhood Iyengar’s Bakery that sells masalas, snacks, and some tasty dosas and meals. Vangi bath masala mix can be prepared at home and has good shelf life. Aayis Recipe, a veteran food blogger’s version can be checked here. This one over here is good too. Traditional recipe only uses brinjal but I used potato and capsicum as well. I quite loved the taste! Pressure cook rice and keep aside. Wash and clean the vegetables. Peel potato, remove stalk from eggplant and capsicum. Cut in rectangular pieces (can be cut as desired). Separate the capsicum pieces from the brinjal and potato pieces. Split the green chillies. Keep aside. Heat an iron kadai and pour oil. Add mustard seeds to the oil. After mustard seeds splutter, add cut brinjal, potato, curry leaves, and green chilies. Add turmeric powder. Stir well to coat oil on the vegetables and close with a lid. Cook for 5-7 minutes in slow fire stirring occasionally. At 5 minutes, add capsicum pieces. Cook for another 2 minutes or so until all vegetables are tender. Add vangi bath mix and salt. Stir for a minute and turn off fire. Add the cooked rice. If rice is very hot, it might break while mixing. So make sure that the rice has cooled down a little bit. Garnish with chopped coriander leaves, roasted peanuts, and lemon juice. Mix well. Serve with papad and raita. I made mixed veg raita using cucumber, onion, carrot, curd, green chilies, coriander leaves, and salt. Makes a wholesome meal of carbs, cooked vegetables, fresh vegetables, curd for probiotic, and the fried papad to add a little bit of sin! We Indians don’t need lessons in frugality. Every tiny thing that can be used will be utilized and will not be wasted. When a ripe jackfruit is cut at home, the fruit is deseeded and eaten. The outer covering of the fruit is given to cattle. Cows love munching on the thick outer covering leftovers. So now the only thing that remains is the jackfruit seed. In mallu land, we make chakkakuru mezhukkupuratti (jackfruit seed stir fry) which is a very easy and tasty dish. It is also added to many different subzis such as avial. Jackfruit seeds are rich in protein, antioxidants, good sources of riboflavin and thiamine, and good for the skin, complexion, and hair. There are two ways to clean and prep the jackfruit seeds to make this dish. Method 1 – Like potatoes, jackfruit seeds take some time to cook. 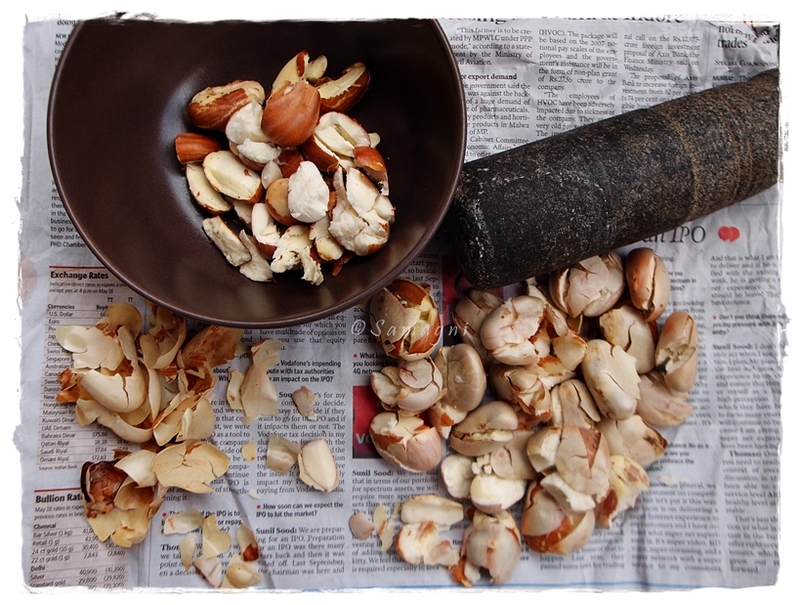 The easiest way to cook jackfruit seeds is to pressure cook them for one whistle along with some amount of water. After pressure cooking the seeds, remove excess water and the off-white outer covering of the seed. Beneath the off-white peel is a dark brown covering. This can be retained. Dice into desired shape (long pieces or into cubes). Method 2: This is the method I often follow. Place the seeds on a newspaper and place this on the floor. Use a pestle to pound the seeds lightly with force just enough to crush them. The peel comes off easily. Cut into desired shape. Cook them in a pan along with water until they turn soft. You can either grind the onion and red chilies into a smooth paste or you can use finely chopped onion and red chilly powder. Heat a thick bottomed frying pan and pour oil. Add mustard seeds. After the mustard seeds splutter, add the onion paste/finely chopped onion and curry leaves. Fry until chopped onion is soft/onion paste loses its raw smell. Add the cut jackfruit seeds and salt. Stir fry for about 10 minutes. You might need to add more oil if you want the edges to turn crisp. Serve as a dry subzi along with rice.